When Kareem Abdul-Jabbar left the game in 1989 at age 42, no NBA player had ever scored more points, blocked more shots, won more Most Valuable Player Awards, played in more All-Star Games or logged more seasons. His list of personal and team accomplishments is perhaps the most awesome in league history: Rookie of the Year, member of six NBA championship teams, six-time NBA MVP, two-time NBA Finals MVP, 19-time All-Star, and a two-time scoring champion. He also owned eight playoff records and seven All-Star records. No player achieved as much individual and team success as did Abdul-Jabbar. In acknowledgement he was inducted into the Naismith Memorial Basketball Hall of Fame in 1995. In 2007, the National Collegiate Basketball Hall of Fame recognized his dominance playing for UCLA from 1967 to 1969. 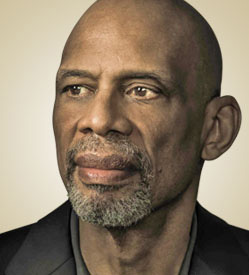 Late 2015, his HBO Sports documentary, Kareem: Minority of One, debuted as HBO’s most watched and highest rated sports documentary of all time. Since retiring, he has been an actor, a basketball coach, activist, and the author of several New York Times bestsellers. His latest memoir, due out in May is Coach Wooden and Me. The book chronicles his 50 years long enduring friendship, both on and off the court, with his UCLA coach and mentor John Wooden. Abdul-Jabbar is also a columnist for Time magazine, writing on a wide range of subjects including race, politics, age, and pop culture. His essays and columns have also appeared in the Washington Post, the Los Angeles Times, and the New York Times Magazine, among other publications. In 2012, Kareem was appointed to be the only U.S. Cultural Ambassador by then Secretary of State Hillary Rodham Clinton and in 2016 Abdul-Jabbar was awarded the Presidential Medal of Freedom, the nation’s highest civilian award recognizing exceptional meritorious service. Currently, Abdul-Jabbar serves as the chairman of his Skyhook Foundation whose mission is to “Give Kids a Shot That Can’t be Blocked” by bringing educational STEM opportunities to under-served communities through innovative outdoor environmental learning.